I am not a waif. That is an understatement, by the way. But some of the guys in my treatment center were waifs – bean poles, the knocked-over-by-a-strong-wind type of body type that was part and parcel of addiction. The drug addicts were the most malnourished. So mealtime at the treatment center was a study in carbs and fat. The cook’s mandate was to get meat on them rickety rack zombie bones clinking through the halls. Most men found themselves gaining weight. Good weight. Mine, on the other hand, was bad weight. I was already a bit overweight when I stumbled into treatment. I used to be envious of the walking skeletons that I cohabitated with. I had heard of all these alcoholics who didn’t eat, whose only calories came from the bottle. I was not one of them. I was in the minority of drinkers who pounded back the burgers and fatty fat fat fats while pounding back the booze. They were inexorably linked. Alcohol gave me the munchies. Badly. So I can’t relate to those who drank all day and never put more than a saltine cracker or raspberry Skittle into their body just because. I gained more weight when I left treatment – sugar being my new “go-to” thing, and realized a few months ago that sugar, too, needed to go. It wasn’t a bad breakup, but sugar still sends me love notes via the waft of cinnamon buns or freshly baked cookies when I walk past a certain bakery daily. If I could “unfriend” sugar, I would. Like in all breakups, I started to look good after I left that relationship. Take that, sugar. I lost nearly 20lbs in 6 weeks. My skinny jeans fit (yes, guys too have that pair of jeans we keep just in case we can fit into them one day). I started to lose the tiny jowl, I no longer had the ladies poke fun at my 6 months immaculate conception pregnancy, and I had more energy and stamina. I felt normal-ish. But of course, it’s those last pesky pounds that haunt me – the last love handles, the wiggly bits around the waist, the slightly puffy cheeks, the general soft spots that refuse to melt away and firm up. And so it is in my sobriety and recovery. When I had the mental obsession leave me through working the steps of AA, I started to lose the heavy weight, the weight that burdened my spirit and soul throughout my entire life. Through making amends and living a life doing the Creator’s will and not mine, I felt the shame, guilt, and remorse shed right off me. Through working with other men, I could see the ego and pride melting away, the dishonesty and resentments burning off, the pain and hurt of my spirit coming off little by slowly. I was lighter, freer and wearing the world like a loose garment. I was dropping the rock, metaphorically, and dropping in stone, UK-wise. But unlike that initial and dramatic weight loss, it’s those last ten pounds that are the toughest to lose. The niggling jiggling stuff. The stuff that peeks through shirts and belts. It’s in those last pesky pounds that need extra attention. Diets need firming up before quads and biceps do. Exercises need to be more focused. Daily attunement to our bodies is critical to our growth and development. And in the spiritual realm, it remains as such. So while I have done the initial heavy lifting (or losing), it’s the last ten spiritual pounds that are the real work now. It’s like a fine tuning of myself, with the occasional overhaul to make sure everything is still where it needs to be. I focus my spiritual exercises where I need them the most – have I been dishonest lately? Do I need to do prayer blasts to tone up my sagging patience? Do I need to up my meditation to battle the bulge of bravado? Does my flabby faux pride need serenity squats? And as I do the things I need to do on a regular basis – meetings, working with others, service, prayer, meditation, reading, etc. not only am I losing resentment, fears, and old ways of thinking, I am starting to see definition and tone in my overall spiritual condition. As I stretch and grow and get outside of my comfort zone, as I tune more into my mind, body and spirit, as I gain access to emotions and states I never could while drinking, I find myself able to achieve more and gain inner strength. Muscles grow in rest, not at the gym. They rest and repair themselves from the micro tears that they endure when we lift weights. And so it is in my spiritual evolvement that the real growth happens in the quiet times, in the moments of solitude and communion with the Creator. It’s in the gazing of the stars and breathing in the burning sage that I find the true clarity and unfolding that my spirit craves. It’s in sitting with myself even when I don’t want to that I find the thickening and cultivation of my soul’s root stock. Somehow I just needed Richard here with me on this one. He’s can be in your corner too. Just ask him. I sometimes sit back and think about how things used to be. I think back and reflect on the old me – the “before” picture, if you will. I sometimes remember how it was to see the world through those eyes, those moist and blood-shot eyes, those filters of pain and anger and it is a dark and frightening place. Malnourished – mentally, spiritually and emotionally. And to think I lived like that for my entire life. I can also sit and see where I am now. The “after” photo. Where I have come to now may not be the stuff of legends and Hollywood movie scripts, but it’s a big change for me. I am not going to win any body building competitions, nor will I be the healthiest specimen on the planet, but it’s a big change for me. But it’s never a complete story, is it? That “after” picture changes. Always changing. And that works for me. I am no longer weighed down with the heaviness of excess and anger. I am freer now. Lighter. Able to slip into my skin easier…just like those skinny jeans. Hi Catherine – thank you so much for the kind words…mean a lot. I don’t think many of us cared about our bodies, or why would we put them through what we did? But we’ve bounced back and I have seen people with big health problems slowly get better and heal as they continue down the sober path. Thanks for being here…wonderful comments! I just love your style of writing, not to mention, of course, all of the wisdom and encouragement you have to offer. It’s interesting how we have both physical muscle and spiritual muscle – and both need exercise. It’s a daily journey and the work we put into our growth physically and spiritually go hand in hand. SO glad you are part of our sobersphere!!! Thanks, MG – I appreciate the kind words. I am glad that we’ve connected too! “Comfortable in your own skin” – I remember hearing that first (well first time it registered) which was in the mad year before I finally admitted defeat and gave up booze completely. It was said about a slim, very handome Frenchman. I thought “He would be look at him!” I had no idea what it really meant at all. Ha ha, well stated, Graham. I didn’t see the double entendre of “comfortable in our own skin” – nice one. I think what you say is true – I know I am not going to be a poster boy for Mr. Body, but I am comfortable with who I am and where I would like to be. No use fretting over a few pounds, frankly. But that doesn’t mean I just stop trying or not do anything. Guys like us need action…spiritual and physical. Thanks for dropping by again! Great having you here. I was also a burger and grease junkie… though, to be honest, I used the fat and oil and salt to combat the hangovers. Every morning after a heavy drinking session (so – every morning of the work week), I grabbed TWO Sausage McMuffins + hashbrowns and coffee at McDonald’s on my way in to work. At the weekends I slept late and then ordered in pizza, burgers, Chinese food, whatever. Grease was my friend in those days, and I was repelled by anything sweet or sugary. To this day, I can take or leave cake, cookies, sweets, etc. But set a pizza or Nachos or burger in front of me and watch me twist. I also struggle with a final 20 pounds, and I feel like I have been losing and gaining the same 5 pounds for the last 6 months. Frustrating. It’s amazing how many people need that grease when drinking…I will have to ask my friend Google about the correlation. But wow, some of the trash we add to our bodies when we’re already poisoning it. I was talking to a friend about this at a meeting last night, and just how either some people lose tons of weight or gain. Most, if not all drug addicts tend to lose weight – one effect of their drug of (no) choice. And yes, coffee sounds great! Make you way across the water and we’ll have a gab fest…ha ha. Paul, you are hitting me right where I need it the most… I am you, before the 20 pounds lost! For too long now, my thought has been, “one vice at a time,” and thus gave myself permission to eat whatever the hell I wanted. Here is the problem, I am still an addict, so do I really think I am going to moderate? Of course not! And now here I am, with another stupid problem to solve. If you get a chance and the inspiration, I would love to hear your thoughts on how you actually “unfriended” sugar, I am positive you will have some motivation for me in your writing! Thanks, miracle – always love your bright and enthusiastic comments! As for the sugar, it’s tougher than the booze, believe it or not. Perhaps it’s because I still leave the door open a bit. I have to sit down and redefine where it is I want to go with this. In the meantime, I am slowly gaining back the weight due to the just as nefarious, but milder brother, carbs – breads, rice, pasta. I have been craving like mad. Sigh. Like you, another thing to tackle. But that’s ok. One thing at a time. I will post something soon about the sugar! I too felt envious of those that drank all their calories. I was overweight to begin with and then packed on 12 pounds when I switched from booze to Starburst. In the last year, I’ve lost about 20 pounds and I’m a solidly healthy weight. I realize the weight loss and other positive changes I’ve made are a byproduct of sobriety. I know the point you were making was more about the gradual spiritual toning that comes with time and practice, just don’t have as much to say on that, I guess. For that reason, I needed to read this post. Thank you for the message. Also, love the funny pictures! Congrats on the weight loss…glad that you’re at where you want to be, which is most important. You are right that all the positives that come into our life stem from our sobriety. We start living in a new way and the rewards come to us sometimes slowly and sometimes quicker. But they do come. And my gratitude often comes from these things that I feel I never really deserved, but i take them anyway. And in return I just continue to work on what I need to work on and give back what I can. 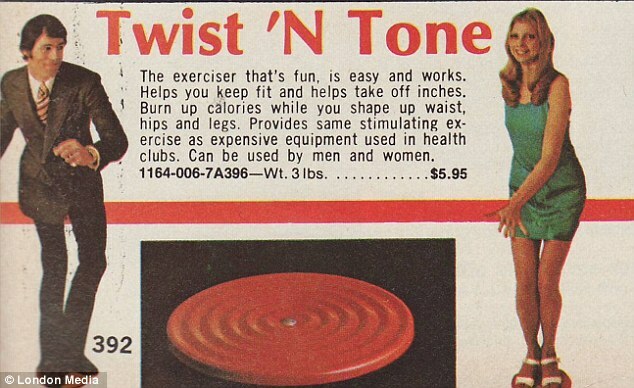 We had one of those “Twist and Tone” things in our house when I grew up. I don’t think I’ve thought about that little disk in 40 years. My parents also had this exercise wheel made of rubber with handles on either side of it so you could roll it out and back. And, and, and …. 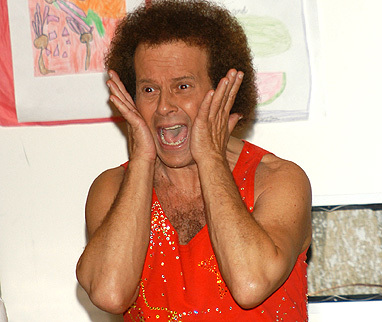 Jack LaLane on TV. good stuff …. I’ve yet to meet an addict that wasn’t cross-addicted. Is there such a beast? I remember thinking one night at a meeting (stuffing my face with cake) that this “new” craving wasn’t working much better for me.So then I started making rules about cake and cookies like I used to do with alcohol. Duh! I had to cut it out (completely) at meetings. I mean come on, they don’t serve alcohol at OA meetings, what are we thinking??????? “The niggling jiggling stuff” …. where do you get this stuff? I thought only girls talked like this.On that note, I need to get out the door and take the dogs (& me) for a walk. Thanks for the reminder of how wonderful it is to be sober and experiencing emotions, some of them for the first time. Thanks for the 5th step…ha ha. We’ll talk about the 4th column later. Love having you here, Lisa. You bring a joie de vivre here every time. One of the side benefits i found in recovery was that the tools i used to stop drinking came in handy for things like over eating and quitting cigarettes. Congrats on your success, brother. Keep up the good works!